as Van Den Hul cable is way too expensive and brings to my experience nothing extra to what cheap cable already has to offer. Testing expensive cables revealed that it is wise to invest in records rather than in expensive cable. Then one day Paul Goodwin, member of the Tannoy Yahoo group came up with the much discussed "surprize cable". Mitja Borko from Slovenia sent me a sample of 10 cm of this "surprize cable". You will find here photos of 5 tested cables types. The "surprize cable" is included. I cannot imagine my taste is of importance here. Four cable samples on the table. All samples are of "No Brand" or "Name X" brands. Which of these is the magic "surprize cable" do you think? 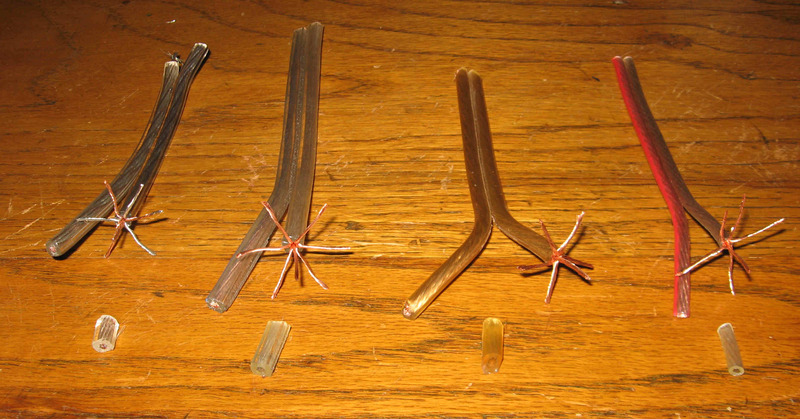 4 samples are from spindles of 25 or 50 M. like on the photo below, only the "surprize cable" was not (?). 14 AWG (~2 mm2) on a spindle. 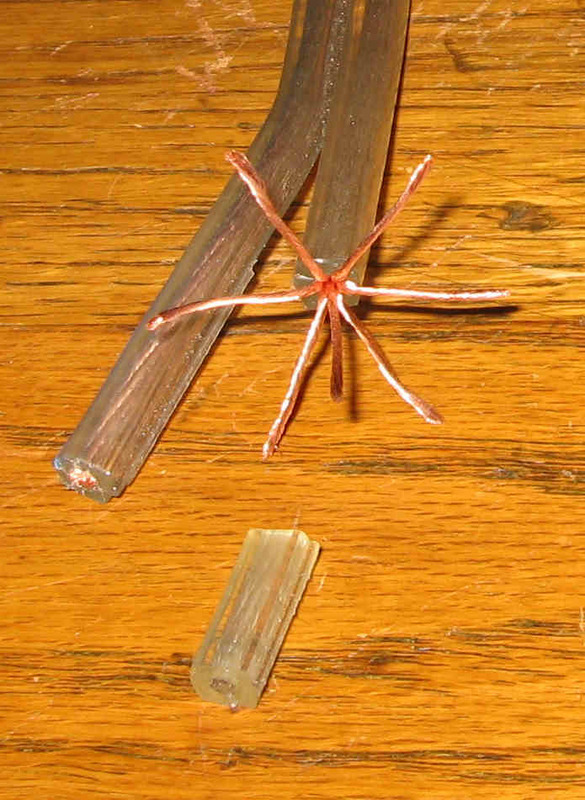 This 14 AWG (~2 mm2) cable has 6 strands and is made of "OFC" copper. Each strand has 26 wires of approx. 0,15 mm. Insulation is of transparant vinyl. This cable was bought in France and at 4 Euros per M.
This cable has no tendency to oxidate. 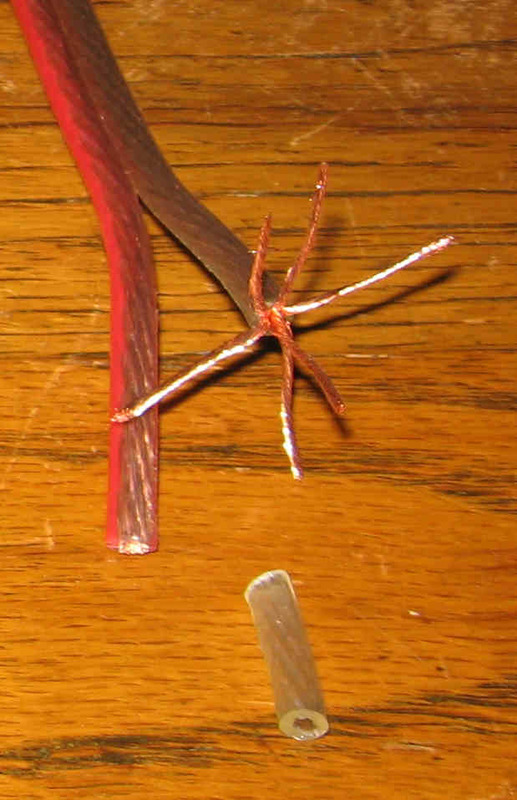 R= below 0.2 Ohms per 10 M. Capacitance is lower than 75 pF per M.
One of the 2 wires is marked red. Conclusion: very good cable for the price payed, usable for amplifiers up to 100 Watts up to lenghts of 10 M, ~30 feet. This 2,5 mm2 (~13 AWG) cable has 7 strands and is made of "OFC" copper. Each strand has 36 wires of approx. 0,11 mm. Insulation is of transparant vinyl. This cable was bought in Belgium and at 6 Euros per M.
R= approx. 0.1 Ohms per 10 M. Capacitance is approx. 65 pF per M.
One of the 2 wires is marked blue. Conclusion: very good cable for the price payed, usable for amplifiers up to 100 Watts up to lenghts of 10 M, ~30 feet +. This 2,5 mm2 (~13 AWG) cable has 7 strands and is made of "OFC" copper. 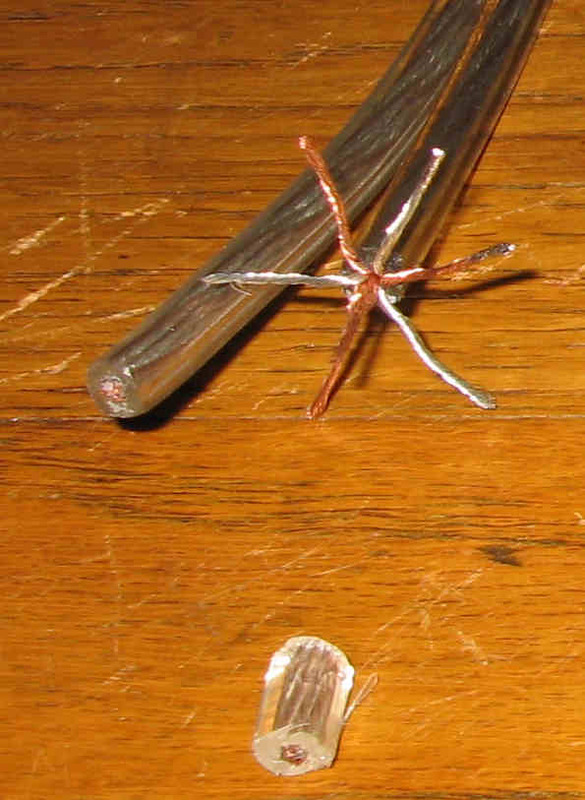 3 strands are of tinned copper wires. Each strand has 32 wires of approx. 0,125 mm. Insulation is of transparant vinyl. This cable was bought in Lithuania, price Euro 4,75 per M.
One of the 2 wires is marked black. Conclusion: very good cable, usable for amplifiers up to 100 Watts up to lenghts of 10 M, ~30 feet +. 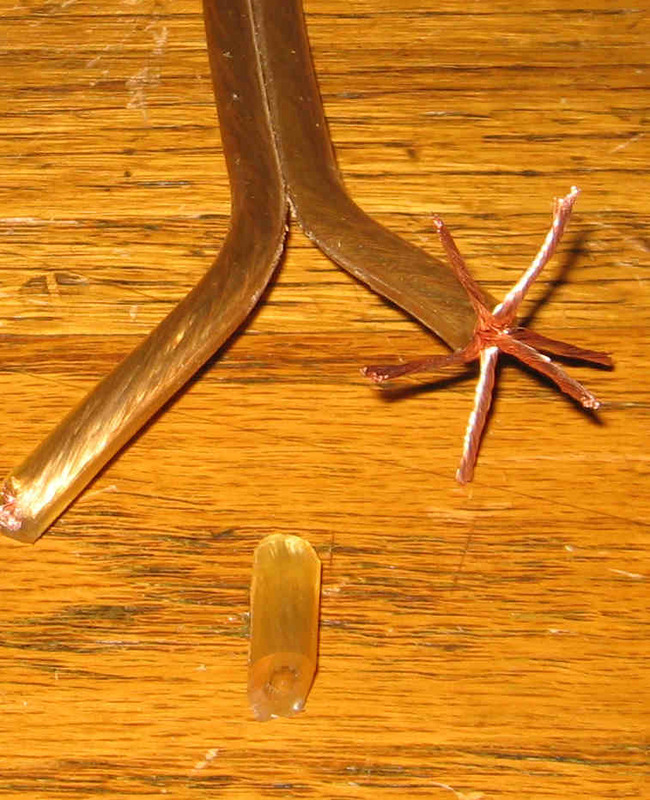 This 2,5 mm2 (~13 AWG) cable has 6 strands and is made of copper. Each strand has 24 wires of approx. 0,2 mm . This cable was bought in Germany at 8,50 Euros per Meter. This cable has some tendency to oxidate. R= 0.2 to 0.4 Ohms (after oxidation) per 10 M. Capacitance is slightly above 75 pF per M.
One of the 2 wires is marked with a line in the vinyl. Conclusion: not so good cable, not recommended, tendency to oxidate with green oxide as seen on the photo. 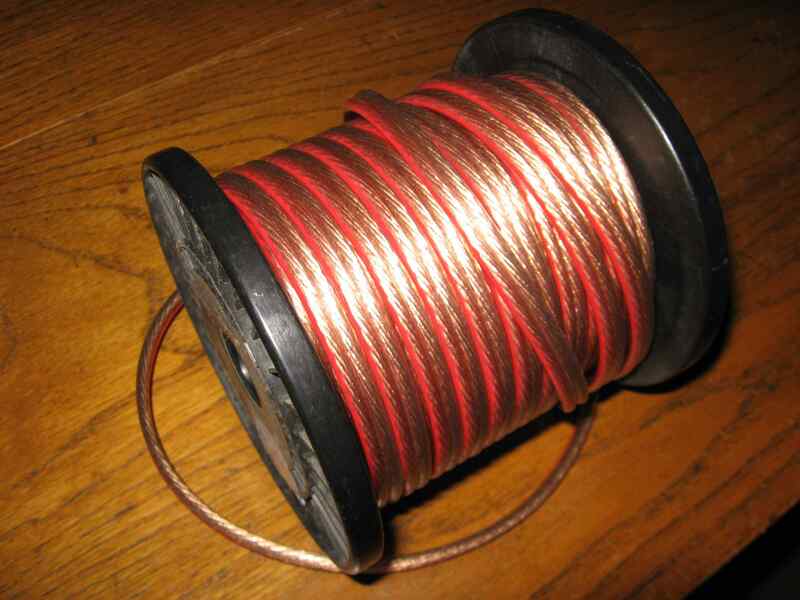 This 0,75 mm2 (~19 AWG) cable has 1 strand and is made of copper. The only strand has 34 wires of approx. 0,15 mm . This cable was bought in The Nertherlands at 1,25 Euros per Meter. This cable has tendency to oxidate. R= 0.3 to 0.6 Ohms (after oxidation) per 10 M. Capacitance is approx. 85 pF per M.
None of the 2 wires is marked. 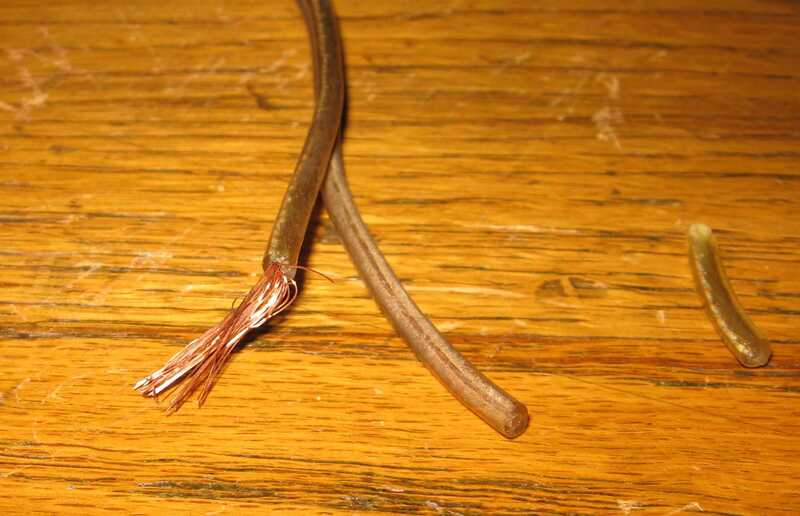 Conclusion: not so good cable, not recommended, has tendency to oxidate with green oxide as seen on the photo. Now do you know what is the "surprize cable"? Its cable # 3. This cable is ok, recommended for use with Tannoy speakers up to lenghts of 10 M. with amplifiers of up to 100 Watts per channel. Your comments are welcome at the Tannoy Yahoo Group. © PE1MMK Hans Hilberink, last update: 19-03-2011.